On Molech, Raeven Devine prepares for his Becoming, the rite that will elevate him to the rank of Knight. But traitors within the Sacristans have other ideas and a shocking act of betrayal sets the stage for one of the bloodiest battles of the Heresy. 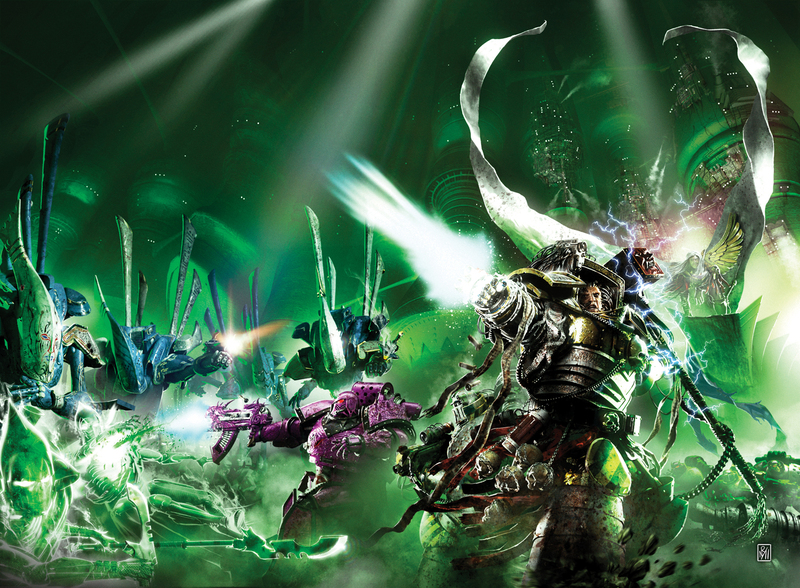 Throughout 2013, the Imperial Truth has been an event-only exclusive anthology of Horus Heresy short stories. It’s got some great stuff in it, not to mention a fabulous Neil Roberts wraparound cover, and this was the story I originally penned for it. Commissioned as a 5000 words Horus Heresy short story, The Devine Adoratrice tells of two brothers on the world of Molech on the day of their Rite of Becoming, where a young noble takes his place as an Imperial Knight. It follows one brother, Raeven, a decadent sort who likes the finer, more debauched things in life, and the unexpected events that transpire as he makes his way to his father’s citadel to become a Knight. I kinda went over my word count by a few thousand (Moi, too many words…?). I was pleased with the story, but space had forced me to allude to a few events within the story I felt I’d rather actually have in it. So I suggested to Laurie Goulding – the anthology’s editor – that I put those scenes in, and expand the story to 10,000 words, where it could go on to exist nicely as an audio drama. Then I’d write another story that would comfortably fit in the 5,000 word region. I expanded The Devine Adoratrice with the bits I felt I’d short changed and wrote another story, Luna Mendax. Huzzah, two stories! As it turned out, with juggling space, word counts and deadlines, a gap opened in the anthology, and an extra-long story was just what was required, so The Devine Adoratrice found its way into the anthology after all. It serves as a form of prequel to events that happen in Vengeful Spirit, a taster of the world and setting in which the Warmaster tramples across. Luna Menda, the other story I wrote, does something similar, in that it paves the way for an iconic character of the Horus Heresy to return in Vengeful Spirit. That story appears in the Black Library Weekender II anthology of short stories.